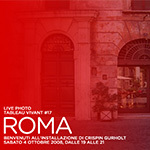 On the occasion of the Contemporary Art Day, Deviforme Gallery presents an installation of Crispin Gurholt, curated by Lorella Scacco, and entitled “Rome”. The Norwegian artist, well known internationally, will realize a “tableaux vivant” placing three models in the antiques gallery. The performance will concern the complexity of the old social structures, and in particularly, the relationship between mother and son. The history of the place chosen for the performance highlights how these events are rooted and cyclical. The event will be presented Oct. 4, 2008 during the 4 edition of Contemporary Art Day, ththe great event promoted by the AMACI Association and dedicated to the art of our time and his audience, with the support of PARC – Italian Ministry of the Culture. The event has been realized in collaboration with the Stenersen Museum at Oslo and under the patronage of the Royal Embassy of Norway. In this edition, the event will involve around 800 cultural institutions on the national territory, for the whole day together to the museums associated with hammock, open their doors for free. Through events, exhibitions, conferences and workshops, the public is invited again this year to participate in the dynamism, vibrancy and cultural richness of our country, the art of our time to recognize the important role that constantly plays in cultural development , socially and economically. Like its predecessors, this fourth edition of the event received the support of PARC – Directorate General for Quality and Protection of landscape, architecture and contemporary art of the Ministry of Heritage and Culture. Crispin Gurholt (n.1965) graduated from the Academy of Fine Arts in Oslo, Norway, and University of New York / Film School SCE. The artist prefers as a media the performance which makes after the live photo “and video. He also works as director of music videos and movies. Among its main exhibits to remember: Vigeland Museet, Oslo (2008), Art Museum of Northern Norway, Tromsø (2007), “Mobile Journey”, Venice International University, 52nd Venice Biennale (2007); Centre Henie Onstad, Oslo ( 2006). Lorella Scacco is an art critic, journalist and independent curator of cultural events. Graduated in Contemporary Art History and Aesthetics. She has curated exhibitions and catalogues of many contemporary art exhibitions in public and private exhibition spaces in Italy and abroad. Collaborate with specialist art magazines. She is competent of contemporary art of the Nordic countries and applied art mobile technology and video. Author of Aesthetics media. Jean Baudrillard and Derrick de Kerckhove published by Guerini, Milano 2004. The gallery of Michael and Robert Deviforme Borrazzi is an exhibition space devoted to ancient and contemporary, in a growing and fruitful dialogue. The space is located in Via dei Coronari.